Deliciously tasty. Source of fibre. Suitable for Vegetarians. A sliced white loaf made with kibbled wheat, kibbled soya and brown linseeds. We believe nature provides exceptional nutrition and the most mouth-watering tastes. 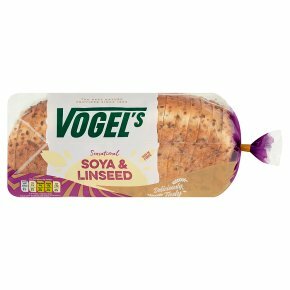 That's why our Soya & Linseed bread is so deliciously tasty; it's high in fibre and packed full of naturally nutritious seeds and grains which are added to nutty kibbled soya and wheat. Perfect for a glorious sandwich but if you're more of a toaster, you are in for a real treat! To avoid danger of suffocation, keep bag away from babies and small children.